Libby's Little Addiction: The Daily Market 30 Day Coloring Challenge + Giveaway! The Daily Market 30 Day Coloring Challenge + Giveaway! Today I'm thrilled to be joining my friend Kathy Racoosin as she kicks off her 10th coloring challenge! She started yesterday on June 1, and the challenge will run through the end of the month. And she's done it ten different times now! How amazing is that? She inspires the crafting community to take a break from the crazy and just spend ten minutes relaxing and coloring, each and every day. I love that so much! So you should have arrived here by way of the Stamping Bella blog - if not, head back to The Daily Marker to start at the beginning! 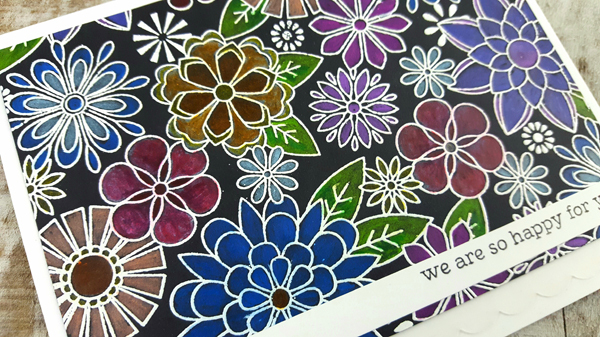 For Kathy's challenge, there is no need to make what you color into a finished card - it's just about the coloring. But of course you're welcome to make cards! So this is the card I made, after coloring a pretty new background stamp from Hero Arts. I stamped Blossoms for Coloring Bold Prints in Versamark ink on black cardstock, and white heat embossed. Then I got to work with my Chameleon colored pencils. I love using these - I'm not a coloring genius like Kathy, and it makes it to easy to blend as two colors that go great together are together on one pencil! But I didn't even do much blending on this - the color itself pops so much on the black paper. For some colors I put white down first and then went over it with the color. I love the look! I finished the card by adding a message from the Peonies stamp set (which, by the way, is another fun one to color! ), and mounted the panel on a Snow folded card. I'd love for you to try coloring this fun background, too! 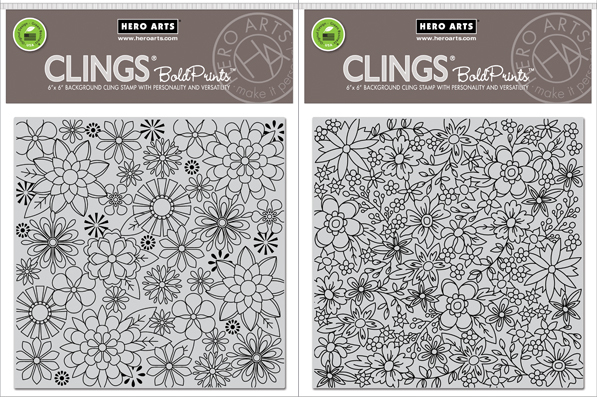 I have two cling backgrounds to give away today, both from the recent Hero Arts Summer Release - Blossoms for Coloring and Flowers for Coloring! I'll draw two winners from the comments to receive one of these stamps! Please leave your comment on this post by next Saturday, June 9 at midnight. Now let's hop! 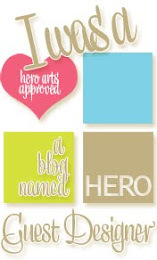 I'm so honored to be a part of this amazing list of stampers & craft companies! From here you should be heading over to my amazingly talented friend Lydia's blog, Understand Blue. I'm sure she'll be knocking your socks off with something! And be sure to visit The Daily Marker for all of the details about The Daily Marker 30 Day Coloring Challenge!! Kathy has lined up a bunch of fun for her 10th challenge! Greet use of a large background stamp .I need to remember this idea. A really beautiful card Libby. I love your colouring and colour choices. I am thankful that you don't need to be an expert colourist like Kathy to end up with a lovely card to be proud of! Thanks for the generous giveaway. Ooh, what lovely colouring! One thing this hop has reminded me is how stunning pencil crayons look on darker card stock. This is just gorgeous! Gorgeous coloring and such beautiful cards!!! I love this background stamp and the colors you chose for it! Love the coloring on dark cardstock! Looks so dramatic! I have always loved coloring on dark cardstock, yours looks amazing! Great job! Love how the colors stand out on that dark background! BEAUTIFUL! I love how you colored on the black card stock. So so pretty! Your background looks amazing! I love the coloring you did. Super girly card ! Good job ! Lovely - I haven't tried Cameleons yet. I really like background images for coloring, yours is gorgeous! The use of dark colors, separated with the white has such a rich appearance. great idea! Beautiful background! Thank you for the inspiration. What a gorgeous card, I love how you used the background stamp! Thank you so much for being part of Kathy's wonderful hop and challenge! Gorgeous card, LOVE these Bold Blossoms Background stamps to color, thanks for your generous giveaway. what a beautiful background cards We can do with thoses stamps ! Ah, your colors on the black are beautiful. Thanks for sharing - love those flowers. Beautiful card! And exactly what I am trying to get better at - colored pencil coloring on dark cardstock. Thanks for sharing! 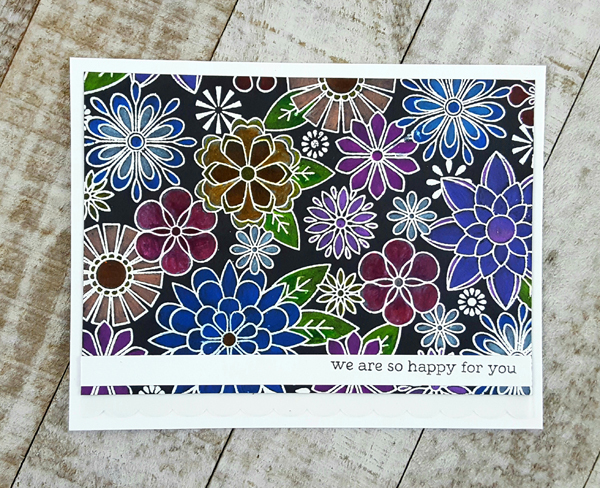 Love your coloring on black on this fabulous card! Beautiful coloring! I love your idea of putting down white under a color - going to try that today! Fabulous coloring!! Here's another thing added to my "I need to try this" list. Great coloring and these images look so fun! Lovely card using your chameleon colored pencils! This looks amazing on the black paper! This is just beautiful, Libby!! I love the white embossing on black with colored images as everything just POPS! I will have to give this a try very soon! WOW!! This is so beautiful..love it on the black card stock! I would love to have a go at coloring one of those awesome background stamps!! So pretty...I definitely need to try this technique! Pretty card! Love to learn about new techniques - thank you! Nice use of the background stamp and lovely card. Fun card and background stamps! So much detail! Just amazing coloring! Really beautiful! WOW!! The coloring you did on this is just STUNNING!! Gorgeous card! Your coloring is just amazing and I love how you colored on black. Thanks for the inspiration and for your generous giveaway! Love the background stamp on black cardstock and you did a beautiful job coloring! Great idea. I rarely stamp on black paper. Beautiful! I would never think of colouring on black card, but it looks fab! I haven't seen that background stamp before! I love coloring flowers. Your colored pencil artwork on the black paper is stunning! Love what you did with the background stamp. It makes me look at my backgrounds in a different light. Can't wait to try your idea. OOOOOHHHHHH AAAAAAHHHHHH!!!! I had taken a sip of my drink as I started scrolling and I stopped everything when I can to the first picture of the card!!! So beautiful!!!!!!! I then realized I still needed to swallow my drink, LOL!! I love your colorful card and the Bold Prints floral stamps! the colors are beautiful on the black background. Will have to try this. Wow, love the background stamps and your coloring! Thanks for the chance to win. Love the coloring and the card. Your card is beautiful ! I love dark background, and you gave the idea to create a card with some black paper. Thank you for sharing. I'm loving all these different techniques on this blog hop - so many things to try!!! Love the black background! love these new HA background stamps - wonderful coloring, Libby! Love the bold vibrant colors against the black paper, it's a gorgeous effect! Beautiful card! Very nice. I appreciate seeing colors that I typically don't work with. It is great inspiration. Really lovely card, your coloring is beautiful. Thanks! Really Stunning card!!! I'm obsessed with colored pencils on dark cardstock right now!!! Absolutely gorgeous Libby, I have been using a lot of pencil cards lately, easy while watching TV! So pretty! I love that you used coloured pencils!! What a striking card! I love the vibrancy of the pencils on the black cardstock. Pretty coloring! I like how it pops on the black! You have convinced me to color on a dark background! Your card is stunning!! This is a beautiful stamp to practice your coloring. Your card is so pretty. WOW!! Stunning! I love the look of coloring on black cardstock! Love your card. I never know what to do with busy backgrounds but you handled it beautifully. Kept the integrity of the background but still made it a card. I love the flower background and I have to try that coloring on black. It looks so cool! Daunting stamps! I love your coloring! I like the colors you chose for your gorgeous card. I just received my Chameleon colored pencils and will be trying them out on black now that I have seen your beautiful card. OMGosh, this is beautiful! These look great on dark paper!!! I've been kinda addicted to using my colored pencils since seeing Yana create so many works of art with Polychromos. I only have Prismas though so I haven't even tried them on dark paper thinking they won't work well. I'm gonna swatch them on black as soon as I finish this hop cause if you got good results with Chameleon, I should be able to get similar results with Prismas, you'd think. Thank you for the inspiration!!! I guess I know what my first project for the challenge will be! I have never tried coloring on black card stock but after seeing your card I may give it a try. It is amazing that the color shows up so well. I am still trying out my color pencils, need more practice. Libby, your card is breath-taking! It's seriously amazing, and I keep staring at it to make sure I don't miss any details! I am inspired to give this another go (first one, well, we don't talk about that - LOL!) Thanks for the gorgeous inspirational piece and the chance at your giveaway! Gorgeous! I love colored pencils on dark cardstock! I'm looking to get a big set of colored pencils and the Chameleons sound interesting. Thanks for being part of the hop. 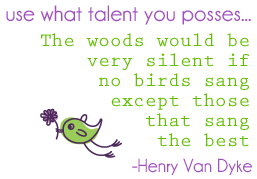 I'm loving all the inspiration! I will have to try my chameleons on black! 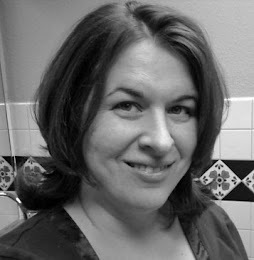 Libby, I am especially fond of colored,pencils and using a dark colored,cardstock (black, deep navy, dark gray,etc). Your card is just lovely! Thanks for sharing your inspiration and for your additional giveaway. Wow, what a fun card! I love this, and thank you for sharing. Thanks also for an opportunity to win one of these gorgeous floral background stamps! Love, love how your coloring looks on the black cardstock. So rich looking. Thank you for sharing your work. Love your colouring on the black Libby - a fabulous result! Terrific card - rich and lovely and also, I feel like it is something I might be able to do with reasonable results. Thanks for the inspiration! Your card is so rich and vibrant! Thanks for the inspiration to color on black cardstock! Never thought of pencils on black, will have to try that! This is a fun hop. I’m just getting back to pencils after a long time of wishing I had more time to practice with water painters and am much happier with results from pencils and gamsol. Your card is gorgeous Libby and I love these background stamps. I don't have good coloured pencils and the Chameleon's are the ones I am seriously considering. I like that you don't need to wonder what colour matches for shading as it is on the other end. LOL A beautiful card, for sure. Gorgeous card...the coloring is so cool...thanks Libbi for sharing!! Beautiful. Thanks for sharing. This is a technique I must try. Black backgrounds with colored pencils are so fun. Yours came out amazing. Oh, I love this. I have to give this at try. Thanks for the give away and inspiration! Gorgeous card! I love how colors pop when done on black, definitely something I'm going to have to try! Thank you for the inspiration! Beautiful card. Love the background stamp! see your comment about them. Love the flowers. Great shading. Hi, beautiful card, colors are so pretty and coloring is amazing, TFS. Have a great weekend. Beautiful coloring and awesome stamp. Great look. Lovely coloring and both of those background stamps look fun to work with! Love your idea to use colored pencils on black. I agree that shading those images would have been overkill, and maybe even distracting. The look is so pretty. I'm a total sucker for anything floral and those background(stamps) make my heart flutter! And I love to use my color pencils on dark cardstock,I think it makes the colors pop! What a great background stamp, love all the colouring you did. Thanks for your part in the challenge, it’s such fun to do the 30 Day Coloring Challenge again! Great coloring on the HA background stamp, both of those you showed are gorgeous! Love Kathy's challenges. Beautiful!! I love your coloring. Your background stamps are wonderful. I love the way you have coloured this one in dark colours - lots of people shy away from them. You did a fantastic job! How cool is that card! I definitely need to try the technique! The dark background against the bright flowers is wonderful. Love it. Why doesn't it occur to us how stunning things can be on the super dark backgrounds. Gotta do this more. Beautiful background! Love all the color. These stamps are right up my alley! So much fun to color and play with! Thanks for yours. I keep forgetting that you can color on colored cardstock! Gorgeous coloring! Maybe I need a set of chameleon pencils? I KNOW I need one of those floral background stamps! such a lovely job on the background and flowers. What an amazing stamp image to color!!! The color is fab! Love the white embossing and coloring on black! I love that you coloued on black paper...such a cool look! Wow that's a lot of coloring but very beautiful. Love your coloring and these bold print flower stamps! Love how the colored pencils look on the black paper. Beautiful! Great card. Looks like a lot of fun just to color the whole card front. I didn’t notice there wasn’t much blending on your card till you pointed it out. Your right, the colors can stand on their own. Beautiful card. I didn’t realize how colored pencils could stand out on black paper till I saw your card and Kristen Werner’s envelope; both are stunning. Great card! Love the coloured pencils on the black paper. I love how the pencils look on black! Very beautiful! Your colours do pop and you've done a wonderful job with the stamping! Lovely card. I am a fan of those background stamps. Your coloring is beautiful. Thank you for sharing your inspiration. Awesome, the bright colors really pop against the black CS. Thanks for the inspiration Libby! This is so beautiful! I love the white embossing and the color-penciling on black cardstock. I have been so tempted to add those Chameleon pencils to my stash. They look like they'd be a lot of fun. Thanks for sharing the details. Nifty to use dark background with flowers, not very common but makes for a great "pop"
Love your colour palette on this sweet card. Those stamps look amazing. Thanks for the chance. Pretty stamp, love the bold flowers! OOOOO! This is yummy coloring. Love the dark, bold look you achieved! Your colouring is so vibrant on black. Thanks for sharing. Beautiful! I haven't tried colored pencils one dark yardstick - yours is stunning! Enjoyed your card! When you said you put down white first, did you use a colored pencil to put down the white or a marker or gel pen...? Just wondering because I use Copic and I never thought to do this before, but I can see how stunning the result is. A great tip! Coloring a background stamps looks like a lot of fun. I did something very similar to this recently and didn't know untilI saw this blog that what was missing from mine was coloring n the background. I can't believe what a difference that makes. Love these backgrounds! Great card! What a fabulous way to turn a background stamp into a focal point. Sometimes I get a little intimidated by all that coloring, but you did a fabulous job, which gives me some confidence! Thanks for sharing and supporting Kathy and the challenge. So stunning and beautiful! Love how vibrant the colors are with the white embossing and black paper! This is stunning! I am so used to stamping on white cardstock that I always forget how beautiful images look colored like this in dark cardstock. Pretty coloring on that awesome background stamp design! How inspirational! Now I need to dig out some old background stamps and start coloring! What a fabulous card and coloring !! This card is just stunning. I looooove these stamps. Must put on my wish list. Thanks for a neat card. Love the dramatic effect of bright colors on dark card stock. Beautiful card. I love all those colors.